San Francisco — T.Y. Lin International (TYLI) announced that the Sellwood Bridge Replacement project in Portland, Ore., won the 2018 Prize Bridge Award in the Major Span category from the National Steel Bridge Alliance (NSBA). TYLI served as Prime Consultant, Final Design, on the fast-track project, as well as lead structural engineer during the Environmental Impact Study Phase. The firm worked closely with the project owner, Multnomah County, design subconsultant CH2M, geotechnical subconsultant Cornforth Consultants, Inc., and Construction Manager/General Contractor Slayden/Sundt Joint Venture. The Sellwood Bridge opened to traffic on February 29, 2016. The highest honor bestowed on bridge projects by the U.S. structural steel industry, the NSBA Prize Bridge Awards recognize significant and innovative steel bridges constructed in the U.S. Winning projects were selected based on innovation, aesthetics, economy, and design and engineering solutions. The Sellwood Bridge Replacement project includes the main replacement bridge over Portland’s Willamette River, modernization of the Highway 43 interchange, and stabilization of the hillside located west of and above the bridge and interchange. The new 1,976-foot-long bridge, 1,275 feet of which comprises a steel deck arch, has three arch spans that support the 63- to 90-foot-wide deck of the main river spans. The bridge carries two 12-foot-wide vehicular lanes, two 6.5-foot-wide bike lanes/emergency shoulders, and two 12-foot-wide shared-use sidewalks and was designed to accommodate future streetcar service. TYLI’s final design reduced the bridge footprint significantly from early concepts, lowering project costs and minimizing environmental disturbances. The bridge design is also based on contemporary seismic codes and satisfies both a 475-year return period event for operations and a 975-year return period for safety. 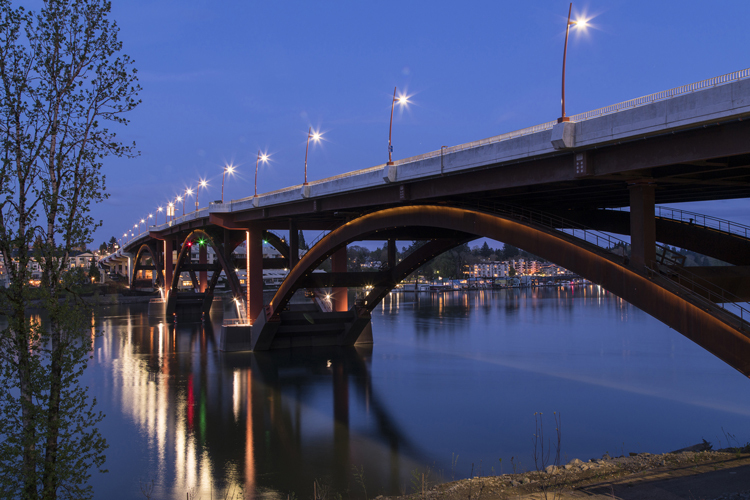 In 2017, the Sellwood Bridge Replacement project earned Greenroads Silver Certification. The project is the 39th Greenroads Project certified in the world, also taking the top rank as the highest scoring project to date. Other industry awards include a 2017 Excellence in Structural Engineering Award (New Bridges/Transportation Structures) from the National Council of Structural Engineers Associations; a 2017 Engineering Excellence Honor Award from the American Council of Engineering Companies (ACEC); and the 2017 Engineering Excellence Project of the Year Award and People’s Choice Award from ACEC Oregon.